Look, See the Bird! 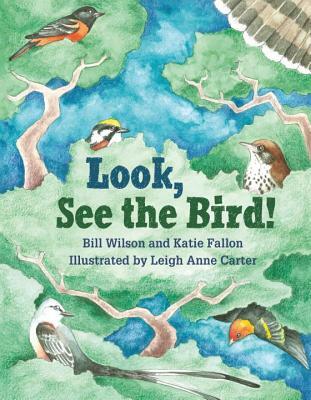 is a beautifully illustrated children's book which seeks to not only promote curiosity in children about the natural world around them, but also to establish the universal quality of having a connection with nature. Look, See the Bird! follows children in a variety of locations, all of whom are learning about local birds and their habits. Beginning with Ruben and his sister Maria, who have decided to spend their day bird-watching in the coffee plants of their Nicaraguan farm, the story wings towards locations as far removed as Alabama and Ontario, lighting down briefly along the way as children the world over join with Ruben and Maria in spirit, looking for birds in their own backyards. Each time, the question is asked by one child to another: "Look! See the bird?" And each time, the children are treated to the sight of a majestic bird native to their home. This unifying question joins the children on the page with the children holding the book, inviting them to look outside, and see what they can see! Katie Fallon is a nature writer, educator, and wild bird rehabilitator. She is the author of Vulture: The Private Life of an Unloved Bird and Cerulean Blues: A Personal Search for a Vanishing Songbird, which was a finalist for the Reed Award for Outstanding Writing on the Southern Environment. She has taught writing at Virginia Tech and West Virginia University, and is a founder of the Avian Conservation Center of Appalachia. Bill Wilson is the co-founder of Birds & Beans® Coffee and a consumer-marketing expert with over 30 years of domestic and international experience. Birds & Beans® Coffee is the only coffee brand in the US that solely roasts Smithsonian Migratory Bird Center 'Bird Friendly®' certified beans, 100% shade grown, organic and Fair-Trade certified coffee. The enterprise is a for profit conservation business aimed at helping stop songbird population drops. Birds & Beans conservation partners include the Cornell Lab of Ornithology and American Bird Conservancy. Leigh Anne Carter is a naturalist and freelance illustrator. After traveling to California to pursue an education for science illustration she moved back to her native city of Charlotte, North Carolina. She illustrated The Birds of Mecklenburg County and is involved in local conservation efforts and education.